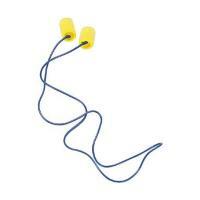 Earplugs are usually made of polyvinyl or polyurethane foam. They are disposable and hygienic, whilst providing high levels of hearing protection, being especially suitable in warm working conditions where perspiration can be a problem. The E.A.R. Classic, being of polyvinyl foam, may be washed in warm water and used several times. The closed cell structure allows the plug to expand gradually and so fit the exact size of the ear canal.